It’s only been two years since the first origin chocolate made from commercially-grown Australian cocoa hit the market. But already demand for Daintree Estates chocolate is outstripping the amount of cocoa available for processing. It’s a good dilemma for the handful of far north Queensland cane growers who took a leap of faith six years ago to plant the region’s first cocoa estates, about 90 minutes’ drive north of Cairns. Those six pioneers of the fledgling niche industry are now intent on expanding production and forging ahead with plans for a chocolate factory and tourism venture in Mossman. 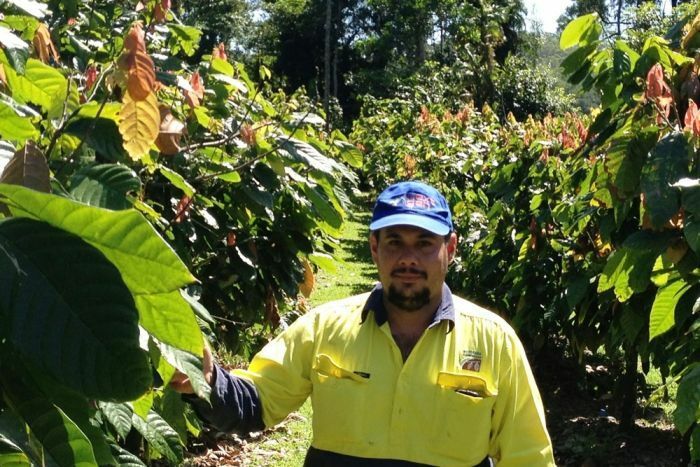 Gerard Puglisi has spent the past three months harvesting cocoa pods and sugar cane on his farm in the beautiful Whyanbeel Valley, next to the world heritage listed Daintree rainforest. The Puglisi’s 1800 cocoa trees are just starting to hit peak production and while it’s labour intensive, the diversification strategy’s starting to pay off. “Most farmers have got these little blocks, like where we’ve got our’s, just a pain to cut so it’s a logical fit and that’s one of the reasons we got in it,” the third generation cane grower explains. “We’re using our sugar, too, in our product and we’re using our cocoa so it’s a good story. Mr Puglisi acknowledges diversification can by risky, but now he can’t imagine a future without cocoa being a part of it. “If worst comes to worst, I can always drown my sorrows in chocolate,” he laughs. “When we went into cocoa, it was a risk but we knew that chocolate was something that people always wanted so we knew there was always going to be a market for it so we were pretty confident. “Hopefully cocoa is the answer for us and we’ll gradually put in a little bit more on our farm. An enduring commitment to diversification and leadership in the sugar industry has earned Mr Puglisi a dual berth in the ABC-Kondinan Group’s Australian Farmer of the Year awards. “It’s definitely a success in this region and nationally, people are aware of us,” Gerard says. But on the eve of the awards ceremony in Melbourne, there’s still fertiliser to be spread, guinea grass to be sprayed and a seemingly endless list of tasks to be done around the farm before he goes. “They tell me sleep’s overrated,” he laughs. And Gerard may not have packed yet, but at least he’s figured out the dress code and will be trading in his trademark high vis work shirt and boots.